Project type: Rear extension and renovation. One large room approx. 30 m2. Mixed floor construction: new part concrete (screeded) floor while existing part of the room was timber suspended. Pipe clipped onto insulation. With domestic house extensions we’re often asked the same question: Can the existing timber suspended part of (e.g.) a Kitchen / Dining Room also be underfloor heated – in addition to the new concreted part? The answer is ‘yes’ – and here we have a good example from a recent underfloor heating installation carried out by ourselves. One important factor to take into account is you’ll want the final floor level to match and allow the floor finish to be level throughout. In this particular case the existing joists had been raised – using battens. This increased the height of joists by about half an inch, which allowed for enough screed to be used in the new part. In joisted areas like this it’s also important to use the sand-cement ‘drymix’ over the pipework. 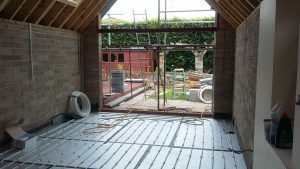 This will make the timber suspended area act more like a screeded floor – from a heating point of view – and so will increase the heat output in this part. 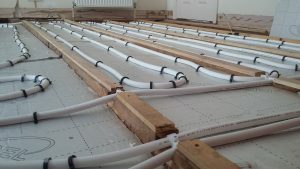 The majority of this 30 sq m room was a new concrete floor, which allowed us to clip the pipe onto Recticel underfloor heating insulation laid over the slab. Nice and easy, very straight forward. This part was later to be filled with a thick fibre sand-cement screed, burying the pipework. 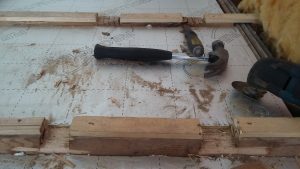 Approximately a quarter of the room had good deep timber joists – however not at standard 400 mm centres but instead at approx. 450-500 mm centres. This was no issue as we instead added an additional (third) pipe run in each bay, decreasing pipe spacing to approximately 150 mm cc. When decreasing pipe spacing you’ll obviously use up more pipe, hence always calculate floor areas and compare with length of pipe available. We assist our own dear DIYers of course – please don’t hesitate to get in touch with any questions. The notches need to be only as deep that is necessary to safely get the pipe over from bay to bay. 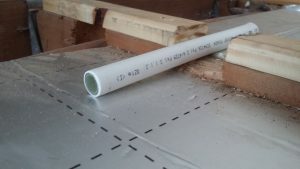 However as you can see from our picture (above), when pipe leaves the joisted area to enter the new screeded floor the notches are a bit deeper… to make the bend smooth and bury the pipe deeper down in the screed. Once the system has been installed, including filling and testing, the pipework is left pressurized. The sand cement floor screed including the ‘drymix’ was to be laid a few days later.